Breast augmentation (with breast implants) is one of the most commonly performed cosmetic surgery procedures performed by the Upper East Side plastic surgeon, Dr. Keith Blechman. Breast augmentation allows a woman to increase the size of her breasts by using implants filled with silicone or saline. By providing balance to her figure, breast impalnts can instill a new sense of confidence and improved self-image. Many women elect to undergo this procedure because they were born with breasts that are small or asymmetric, or their breasts may have changed following pregnancy or weight loss. As of 2006, silicone implants have been approved by the US Food and Drug Administration (FDA) for use in cosmetic surgery patients that are at least 22 years old. Numerous well-designed and long-term studies have shown that silicone breast implants do not increase the risk of breast cancer or connective tissue disease. Although saline implants, consisting of a silicone shell filled with a salt-water solution, are available for breast augmentation most patients prefer silicone, as they feel more natural. 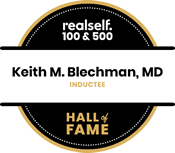 During your consultation the top rated plastic surgeon, Dr. Keith Blechman, will discuss your desires and expectations with you. Measurements will be made to carefully select the optimal size implants for you so that you may safely enjoy an enhanced, yet natural, appearance. 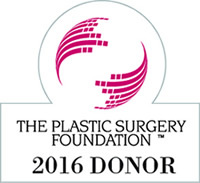 A variety of anatomic locations are available to make incisions for placing the implants. Most commonly, a small incision within the fold near the base of the breast is used. For some patients, an incision may instead be placed at the edge of the areola or within the armpit. During your consultation Dr. Blechman will discuss which option is best suited for you. The implants are typically placed under the pectoralis muscle which can help with achieving a more natural shape as well as minimize the risk of developing a complication referred to as a capsular contracture. The procedure is performed under general anesthesia and typically lasts less than two hours. Patients go home the same day. Small pieces of tape placed during surgery will remain on the incisions for a few days, and a soft bra without underwire may be worn. There will be no stitches to remove, as they will be placed beneath the skin and your body will naturally break them down over time. Patients are permitted to walk and return to their activities of daily living immediately following surgery, however strenuous exercise and sexual activity should be avoided. Most patients return to work within a few days. Complications are uncommon. As an experienced, board-certified plastic surgeon, Dr. Blechman takes a conservative and educated approach to breast augmentation, and will discuss in detail all the risks, alternatives, and benefits prior to performing surgery. 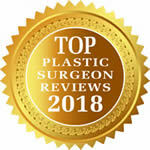 All breast augmentation (breast implants) consultations and procedures are performed by Keith M. Blechman, M.D., an Upper East Side NYC plastic and reconstructive surgeon, Board Certified by the American Board of Plastic Surgery. Dr. Blechman is a graduate of renowned plastic surgery training programs at both New York University and MD Anderson Cancer Center, and he specializes in cosmetic surgery, reconstructive procedures. Dr. Blechman is recognized for his expertise in the field and was honored to be included on the 2016 and 2015 New York Super Doctors lists.